God bless the people who stood in line for 3 hours or used a flashlight to vote! Small town living, with good timing, meant walking right in, showing your ID and voting. I spent more time talking with people I know on the way in and out than I did filling out my actual ballot. A true social event! NOW.....I have to say how disappointed I was with the young people I queried at the store. Did you vote yet?......no I am not registered......no I don't have an ID...…..no I don't understand it!!!!! Really and we are going to leave everything in your hands? I was shocked. Next election we may have to have voter tutoring! i keep saying that these seniors in high school need to be pre-registered to vote and shown how to cast a vote. I came across folks at my job who arent registered, don't even know who or what to vote on. I do not make my affiliation known at work, however i was asked what democrats to vote for. My bosses frown upon political discussion during work hours, which i agree with, so the talk was quickly stopped. 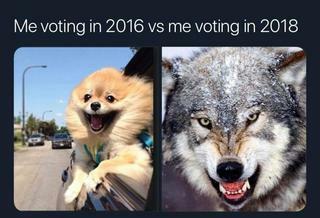 I was very shocked at how many folks were not voting this year. Kim Davis, who was jailed in 2015 while embroiled in a gay marriage license controversy, has lost her re-election bid. Democrat Elwood Caudill Jr. defeated her Tuesday for the Rowan County clerk seat. Davis, a Republican, refused to issue the marriage licenses due to religious reasons and was previously jailed for five days. Davis made international news in 2015 when she stopped issuing marriage licenses days after the U.S. Supreme Court ruling, citing her religious beliefs and saying she was acting under "God's authority." Gay and straight couples sued her, and a federal judge ordered Davis to issue the licenses. She refused and spent five days jail. She was released only after her staff issued the licenses on her behalf but removed her name from the form. The state Legislature later passed a law removing the names of all county clerks from state marriage licenses. She was first elected as a Democrat in 2014, but later switched parties because she said the Democratic party "abandoned her." A teacher in Florida found a container labeled “Provisional Ballot Box” in a storage area of her elementary school on Thursday. Lakeisha Williams, of Broward County, said she discovered the ballot box two days after Election Day at Miramar Elementary School — where it was apparently left behind by election workers. “I went into the area that we use for storage and saw it in there,” Williams told The Post. Williams said she did not touch or look inside the box. Instead, she told the school’s principal and they decided to contact a local state representative. “I don’t know where it is now,” Williams said, noting that all provisional ballots needed to be received by county officials before 5 p.m. Thursday. Votes are still being counted in the Sunshine State. The state’s races for US Senate and governor have tightened to a difference of less than 0.5 percent — potentially triggering an automatic recount. Republican Gov. Rick Scott led democratic incumbent Bill Nelson by just 17,000 votes — or 0.2 percent — for the Senate seat on Thursday. In the race for governor, Republican Ron DeSantis was leading Tallahassee mayor Andrew Gillum by about 30,000 votes — or 0.4 percent. Don't males still need to register for Selective Service (for possible draft). Back in the 70's, where I lived at least, they were also registered to vote. Same was true if they went in the military early. What's with people who don't vote? Is it laziness? Is it not caring who gets voted in and who makes rules governing their bodies? Yes, males 18-25 are required to register with Selective Service. But that doesn't have anything to do with registering to vote. "The youth generation is proving itself to be a very powerful force that demands to be heard and demands leaders to be responsive to their vision for a progressive and inclusive America, which is really important because by 2020, they will comprise nearly 40 percent of the electorate," says DeWitt. It does state that there are many who did not vote too, but that can be seen in all age groups. Really glad the youth has decided to become a little more active. There seemed to somewhat of a hiatus of youth activism during the 90s until the recent years. Most of the HIV activism was done by boomers who had to shoulder much already from the ERA through LGBTQ rights including marriage equality. Many Boomers were getting weary with no help or relief on the horizon. What I was writing of earlier is that 18~24year olds were automatically registered to vote at age 18 with signing up for the draft. No,I'm not advocating a draft, just selective service and voter registration could somehow be linked. That's my idea for the men. Any suggestions how to automatically register the women? I don't know about mandating voter registration but I love helping women register. Since I work in housing with previously homeless women, one of the first things I do with their intake paperwork when someone moves into one of my programs is offer to help them with their voter registration form at their new address. Chronically homeless women and incarcerated women are often unable to vote for years on end. This year I had a record high of newly registered voters and first time voters. I drove back and forth to the polls all day and the women were so excited for their voices to be heard. Agreed... at the very least … along with a bunch of other stuff they need to be successful adults. I wouldn't mind seeing it made (some kind of) mandatory. I think it comes down to most things in life … if we're not personally impacted by something... we don't much care one way or another. Why not selective service for women also? What I was writing of earlier is that 18~24year olds were automatically registered to vote at age 18 with signing up for the draft. No,I'm not advocating a draft, just selective service and voter registration could somehow be linked. That's my idea for the men. Any suggestions how to automatically register the women? What do y'all think about compulsory national or civil service in the U.S.?